This is an existing Village Green that Anne Wilks established in 1969. VG 126 runs from the West Beach caravan park to the Battery and so includes all the beach huts in front of the seawall at West Beach. When a landowner erected a new beach hut on the Village Green in 2009 the WBC opposed the landowner’s retrospective Planning Application and it was rejected by the Development Control Committee of Canterbury City Council. (CA/09/00594/FUL). Following this legal action was taken by CCC to have the extra hut removed. Subsequently, the landowner, Seasalter Shellfish, has made an application to erode the Village Green by exempting the area of Village Green occupied by the existing colony of huts. WBC is one of the objectors in the Public Enquiry being held over Seasalter Shellfish’s request to amend VG126. Although Anne Wilkes successfully registered this stretch in 1969, her wording to exclude the beach huts and seawall from the VG area was omitted from the register. Technically this means that all the front row of beach huts on West Beach are illegal on a VG so the landowners (of most of them) being Seasalter Shellfish (Whitstable) Ltd have applied for an amendment to exclude the huts. Whilst the WBC does not object in principle to the need for an amendment so that the beach huts can be “legalised” (no one wants the front row gone, that was never Anne Wilkes intent) WBC are objecting to the area proposed by the landowners for exclusion as it is far bigger than the area of the huts. If the applied area is deregistered it would potentially allow the hut owners to exclude locals from using the beach in between and directly in front of the huts. 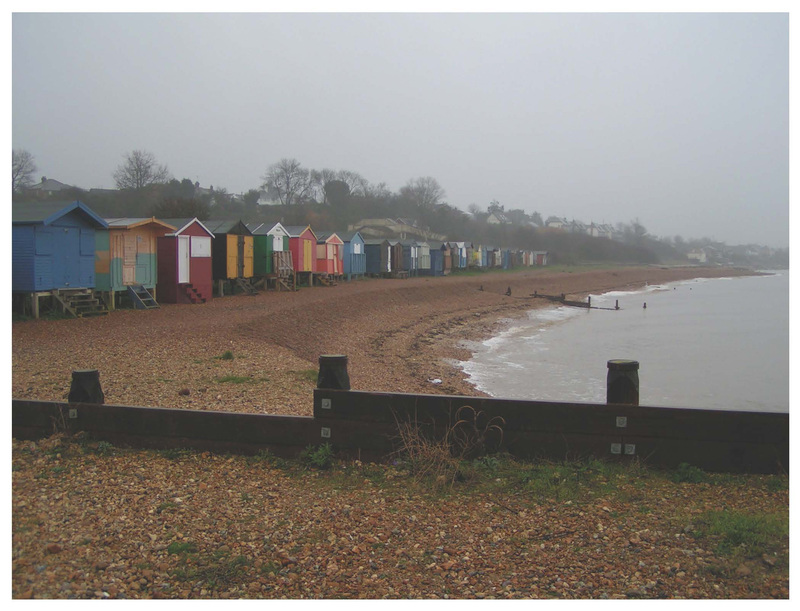 Seasalter Shellfish would like to exclude a single continuous strip approximately 8m wide by 250 m long whereas WBC think it far more suitable to only exclude the footprint of each hut to allow general usage across the beach as exists at present. 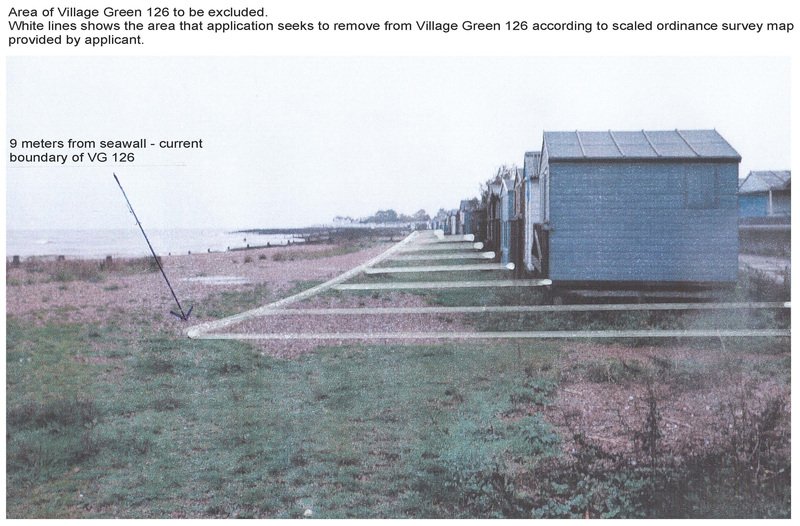 The photo shows the area of the beach which Seasalter Shellfish would like to exempt from the Village Green, thus effectively removing the strongest level of protection the beach has. It is an alarming prospect. Anne Wilkes never intended for an area this large to be excluded. She spoke specifically of only excluding the beach huts. 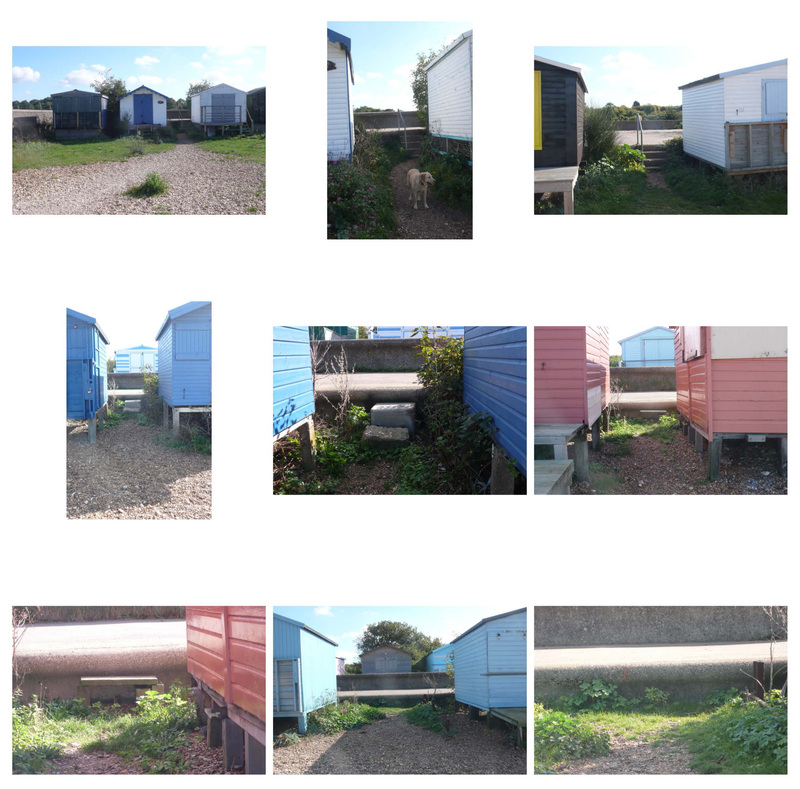 One of our main concerns is that if the whole strip is removed from the VG, it will allow the beach hut users and landowner to close off the gaps between the huts, which allow access from the path to the beach. Some of these gaps have concrete steps as part of the sea wall, some have informal steps constructed by individuals and some are just well worn tracks that allow passage from path to beach with an unassisted step up onto the sea wall. The next photo was taken in February 2011 prior to new groins and reseeding due to erosion. Canterbury Council and Defra expect that the beach will continue to erode in future.